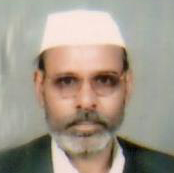 Rathi Vinay Jha retired as the Secretary, Ministry of Tourism, and Government of India in 2004. Prior to that she has held many positions related to the crafts sector. 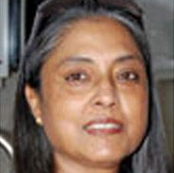 She was one of the founders of NIFT and served as its Executive Director from 1987-93. She was also the Managing Director – Tamil Nadu Handicrafts Development Corporation and CMD – COOPTEX from 1985-87. After serving the government she was the Secretary General of the World Travel and Tourism Council India, and Director General of the Fashion Design Council of India. She was a Member of the NIFT Board of Governors and Chairman of the Durgabai Deshmukh College for Visually Impaired. 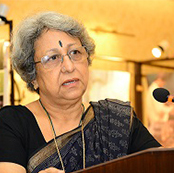 Currently she is the President of AIACA Governing Board, Chair of Indian Heritage Cities Network ( IHCN ), and Member Board of Governors of Indian Foundation for Arts ( IFA ), Madras Craft Foundation ( MCF ), Plan India, Sasakawa Foundation, The Coorg Foundation, C to K Foundation ( craft sector in J&K ), and the Indian Institute of Craft & Design. Roopa Mehta is the CEO of Sasha Association for Craft Producers (“Sasha”) and the Secretary of Sarba Shanti Ayog (SSA) its associate development organization. Sasha/SSA provides business support inputs and market access for sustainable livelihoods to artisan groups based largely in rural communities and semi urban areas. She is on the Board of Sadhna, the handicrafts and income augmentation programme of Seva Mandir, Udaipur and the Managing Trustee of Ruro Agro Services Association, a registered trust which develops natural agro based products, trains producers and identify suitable markets. She is also on the Board of COMMACT International and World Fair Trade Organisation(WFTO). 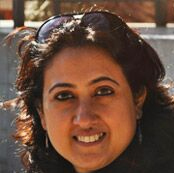 Roopa Mehta is a MBA from Delhi University with further professional qualifications in Social Communication. In the earlier part of her professional career, Mrs. Mehta worked in hospitality and merchandising sector and she was the Chief Executive Officer of a renowned textiles manufacturing & retailing company before joining Sasha. 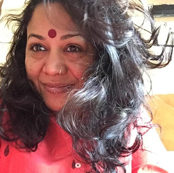 Madhura Dutta, the Executive Director of AIACA, has 14 years of experience in the social development sector with extensive experience in livelihood generation models using culture across India. She has worked in UNESCO and has contributed towards development of Cultural Policy and Cultural Entrepreneurship focusing on creative industry models. Her vast experience on community development matched with her passion in handicrafts has brought her to AIACA, a dynamic organization in the crafts sector. She has a Masters degree in Sociology from University of Calcutta, a Masters degree in Sustainable Development from UK and a PhD from Tata Institute of Social Sciences, Mumbai. She is also a Commonwealth Scholar. 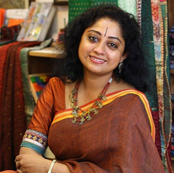 Rema Kumar, textile designer based in Delhi, has been working with a large cross-section of weavers and master craftsmen along the length and breadth of India for almost two decades. Her focus has always been integrating tradition with novelty, infusing new life into age-old techniques by way of vibrant colours and designs and constantly encouraging weavers to think out of the box to create something different. Though her passion lies in designing saris, and trying to keep the interest in the six yards alive among our Indian women, her collection also includes stoles, dupattas and home accents in the form of dhurries and floor-cushions. She also designs fusion ethnic wear created out of the fabrics specially detailed with ethnic indigenous Indian surface detailing methods like Batik, Kalamkari, Handblocks, Kantha and so on. She has also been working as freelance design consultant and has been involved in various weavers’ workshops for organisations like Dastkar and SEWA. A graduate in Textile Design from the prestigious National Institute of Design, Ahmedabad, has been working with artisans from across the country since 1991. After her graduation she did a small stint with Anokhi in Jaipur, but wanted to work with more crafts besides block printing, so then she worked with Fabindia for 15 years collaborating with handloom weavers, block printers, embroiderers, Dhurrie weavers, Jutthie makers and many more. She engaged with the artisan and their craft and created designs in their own language to help them open up new markets, from 2007 to date she has worked on projects with IL&FS (Infrastructure Leasing & Financial Services), Earthy Goods, Jindal CSR programme and AIACA (All India Artisans and Handicraft Association). She has done training programmes and design interventions for many artisan groups to help in capacity building and opening new markets. 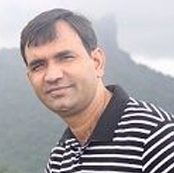 Mukesh works as the Business development Leader of Traidcraft India. He is a social sector specialist with 15 plus years of experience in managing and coordinating social and economic development programs across India. He is passionate about producers collective and works towards its governance and business sustainability through designing contextualized need based interventions. His passion towards producer’s collective led him to explore and initiate sTepUp – a not for profit initiative to build capacities of market based community collectives. Prior to this, he has worked on community development projects with grass root institutions, eminent Indian grant making institutions and an international NGO. With expertise in programme management and building successful partnerships, he has significant experience in the areas of livelihood, enterprise development, institutional governance, youth development and social research. A graduate from XISS, he further studied non-profit management from Lee Kwan Yew School of Public Policy, Singapore. Mukesh is also part of the South Asia programme of Traidcraft to build capacities of producer Institutions involved in Fair Trade in India and Bangladesh. 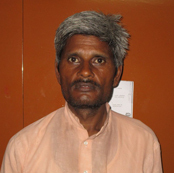 Gopal Pal, a master weaver of the Ramnagar cluster was associated with the PACS project as a beneficiary. Hazi Munirudeen, a master weaver from Kotwa village has seven handlooms and two power looms. He has more than 45 years of weaving experience. Apart from running the handlooms, he also manages marketing activities. Aftab spearheads a registered society by the name of “Afreen Handloom”. 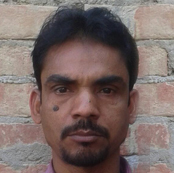 He works on the techniques of weaving and has a reputed clientele across India. He has been able to employ 25 weavers with 15 looms. His annual turnover as per the recent estimates is Rs.16 lakhs. Aftab has also been involved in socialism since 2006 when he joined ‘Bunker Dastakar Adhikar Manch’ a national forum to work for the rights of weavers’ community. Over 30 weavers have joined this forum under his leadership.